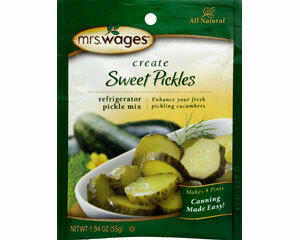 Get your Mrs Wages Sweet Pickles - 1.94oz mix yields 4 Pints of Pickles at Smith & Edwards! Make succulent pickles with less work and time: add these seasonings, vinegar, sugar, and water to your cucumbers for 4 pints of no-process pickles or pickled fresh or frozen veggies. Ready for tasting in 24 hours!